Ian McMillan's guests on the Cabaret of the Word include the novelist Nicholson Baker, performer and composer Nathaniel Mann and Lynne Murphy on British and American dictionaries. Ian McMillan's guests on the cabaret of the word include the writer Nicholson Baker, whose new novel 'Traveling Sprinkler' updates us on the story of the poet Paul Chowder from his previous book 'The Anthologist'. Performer and composer Nathaniel Mann plays songs inspired by the secret language of robbers, and Lynne Murphy explains some of the differences between British and American Dictionaries. In his new novel ‘Travelling Sprinkler’, Nicholson Baker picks up the story of Paul Chowder from ‘The Anthologist’, as he reaches the ‘fearful age of fifty-five’, and is attempting to write songs. Nicholson Baker explains how the writing the book came out of an attempt to rediscover his dormant musical side and how he learnt to write novels by reading poetry. Nathanial Mann performs with the experimental trio Dead Rat Orchestra. 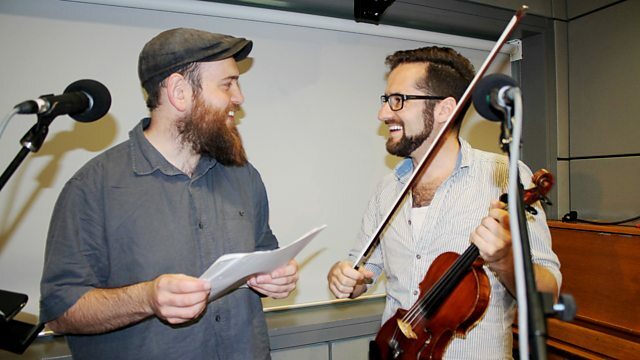 As part of our series on Secret Languages series, Nathanial performs songs based on robber’s cant, the secret language of thieves, which he originally came across whilst researching the music for a film about the Tyburn Gallows. Lynne Murphy teaches Linguistics at the University of Sussex. For The Verb, Lynne explores the difference between British and American dictionaries, discussing how dictionaries are a reflection of the culture in which they were written. Daljit Nagra launches this year’s Proms Poetry Competition. The competition is open for entries on Sunday 8th June, and the closing date is Friday 17th August. For more information please visit the BBC Proms website.